Logistics has become a booming industry in China especially after the country’s accession to the WTO. International corporations pay close attention to trends and developments in this land of opportunities, but must also be prepared to face the challenges of Byzantine regulations and fragmented operations. This report surveys the logistics environment in China. It focuses on describing the major logistics players, special challenges and current business strategies in Chinese Logistics. The report concludes with a case study illustrating many of the issues. This document is based on a report prepared in fulfillment of the requirements for the Dual Master’s degree at the Georgia Institute of Technology and The National University of Singapore. As China opened up in the late 1980’s, many Western consumer goods manufacturers set up plants or formed joint ventures there in an attempt to tap the huge market potential of the country. By the 1990s, most Fortune 500 companies had branch offices in China. Other manufacturers come to China for low cost labor and find the rapidly growing internal market a secondary benefit. At the same time national manufacturers are working to transform themselves from the old command economy and to compete on an international scale. Today, with China’s accession to WTO, MNCs are busy shifting their Asian headquarters to China and new players everywhere are entering the fray in a scramble reminiscent of the gold rushes of the Wild West. Some contend that China is poised for a renaissance and will resume its crown as Asia’s economic center. No one can deny that it is becoming the manufacturing center of the world. What is China’s allure? Is it really an important market place for MNCs? Data from the World Trade Organization point to the answers. Since 1978, China boasted a GDP average growth rate close to 10% and its per capita income has quadrupled. The value of imports and exports as a share of GDP tripled from 1978 to 1995. In 2000, China’s trade in goods represented 43.9% of GDP. The nation’s economy is increasingly integrated with world economy. Now, China is among the top five nations of the world in terms of trade and direct investment. Foreign Direct Investment (FDI) soared from $2.3 billion in 1987 to $45.6 billion in 1999. In 2001, labor costs averaged $0.60/hr and GDP growth was 7.3%. The country’s merchandise exports were $293.7bn and imports were $266.5bn, creating a trade surplus of $27.2bn for the first 11 months of 2002 and FDI is predicted to exceed 50 billion USD. Rapid, sustained economic growth has made China’s economy the world’s third largest (based on the World Bank’s purchasing power parity adjusted measures (PPP)). In 1998 China’s GDP, measured at purchasing-power parity (PPP), was $3.8 trillion, according to the World Bank’s latest World Development Indicators. This makes it the second-biggest economy in the world, ahead of Japan’s $3.0 trillion. It stands poised to become the world’s second largest economy by 2015. The Chinese people have benefited from this growth, which has put more money in their pockets. Nearly 50 million Chinese enjoy an annual income equivalent to at least $18,000 adjusted for purchasing power; by 2003, this number is expected to triple. Massive growth in international trade and domestic economic activity has raised China to a prominent position in the strategic plans of nearly every multinational firm. Many of these firms have already made China a substantial part of their businesses. Nevertheless, as China races rapidly forward as a manufacturing base, distribution in the country is still a challenge complicated by geography and outdated infrastructure. This section focuses on China’s geographic features, political divisions and demographics. China covers roughly 9.7 million square kilometers making it slightly larger than the US. Superimposing maps of the two countries demonstrates some interesting similarities. Beijing and New York are roughly on the same latitude, as are other major cities like Shanghai and Atlanta. However, a topographical map shows huge differences. The geographical features change from west to east in three steps in China. While the US has both east and west coasts, the west of China is filled with mountains, plateaus and deserts. Mid-China is full of valleys, rivers and meadows. Fertile soil is mainly concentrated in the east. “Transportation between East and West China is like playing squash, while in the US it is like golfing.” In China, only one third of the land area is flat. As such, distribution in China must be adapted to suit the needs of different regions. For instance, in the case of Urumuqi, large shipment sizes (enough to cover demands for a few months) during the summer are necessary as most roads into the region are usually covered by snow and impassable during the winter. In the US, the long coastline gives western cities wide access to the sea and blesses them with oceanic weather. In contrast, the west of China abuts the Mid-Asia Mountains and Plateaus. This region alternates between the dry monsoon and the cold Siberian winter. Annual rainfall along the Mongolian border is below one inch, while areas along the southeast coast like Guangdong and Zhejiang receive over 75 inches. Under Deng Xiao Ping’s policies, the east has developed over time into a relatively rich region with a strong agriculture base and ports to support international trade, while the west has continued to struggle with poverty and unemployment. Hence there is a wide discrepancy between the prosperous east and the poor west in the goods transported. After years of relative neglect, China’s environment has improved over the last decade. Energy per capita use in 1997 was equivalent to 903.3 kg of oil. Per capita electricity use was 701 kwhs. In the past decade CO2 emissions have dropped, and the water quality has improved. However, the cost of development in China is still higher than in other countries larger than 7million km2. “Something you can do with USD$1 in common situation and other places of this world will cost you USD$1.5 in China”. As a result of its geographic characteristics, logistics in China is a huge operational challenge. Matching loads is difficult and vehicles often face an empty backhaul. Most containerized goods move east to west, logged wood from northeast to southeast, and coal, oil and minerals from west to east. For example, a multi-national corporation in the food industry explored the possibility of selling its premium brand ice cream in Xinjiang in the summer. While a normal truck would cost around Rmb9 ($1.10) per ton per km, even at a premium charge of Rmb12 ($1.46), few truckers would undertake this long journey. There is little produce that requires a refrigerated truck for the return journey from Xinjiang. An integrated logistics service provider with large-scale operations should be in a better position to exploit these imbalances. China is a country of multiple, separate, self-reliant provinces. The majority of the 31 provinces deem self-reliance as the engine of prosperity, a legacy of the post-1949 Maoist doctrine. Consequently, local governments have created redundant, but often incompatible industrial, economic and political infrastructures; overcapacity in manufacturing and distribution; minimal synergies among provinces; complex and inefficient bureaucracies; and a highly unproductive emphasis on local protectionism. For example, most Chinese wholesalers and distributors sell only in their regions. Informal provincial barriers and protectionism can prevent local companies based in one province from operating in another. As a consequence, the thousands of trucking companies and hundreds of wholesalers make logistics coordination very difficult. Trucks licensed in Beijing, for example, can operate in any province of China, but must wait until midnight to make deliveries in Shanghai. Local governments and different local administrations establish multiple toll collections. Besides highway toll stations, the local management also collects other fees under different titles. The transportation time and cost from the north to the south are amplified by frequent tolls and fee collections. China’s local governments hold great power compared to their US peers and so the lack of a coherent coordination logistics policy is likely to persist. Twenty years ago, the newly ascendant Deng Xiaoping changed the course of China’s economy with a pair of simple observations. To get rich was glorious, he said, but not everyone in China would manage to do it at once. Some people, and some regions, would have to be allowed to get rich first. And some did. By virtue of their geographic advantages and some beneficial government policies, China’s eastern provinces have enjoyed unparalleled economic development that has left the populous rural areas in the west far behind. As a result, the distribution of wealth in modern China is imbalanced (Figure 3 & Figure 4). Now, even as it commemorates the anniversary of Deng’s reform and celebrates its successes, China’s government is struggling to mitigate these disparities. China is the world’s most populous nation with 1.3 billion people in 2001. This number is still growing at a rate of 0.8%. About 0.8 billion or roughly 62% of the population lives in rural areas mostly in the west and north of China. However, the country’s demand is mainly concentrated in the south, along the coastal provinces in the east and in the major cities like Beijing, Shanghai and Guangzhou. Not surprisingly, these regions contain China’s major logistics facilities including ports, highways, and hubs. They also have the nation’s highest per capita income. Initiatives to establish logistics networks in China’s less developed north and west have faced great challenges. Low per capita income, local protectionism, poor access and a lack of infrastructure make doing business difficult. 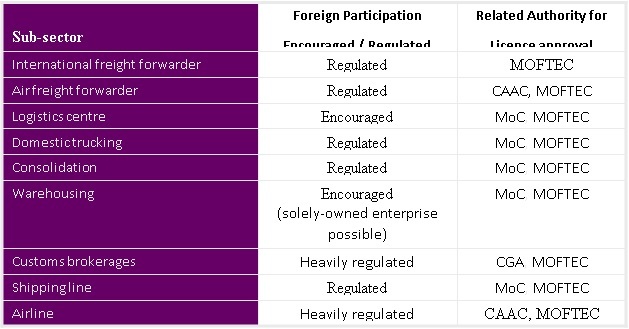 Most foreign companies have given these regions low priority for the short term. The main population centers have always been in the wheat-growing plains of northern China and the rice paddies along the Yangtze River. However, corporations with household brands and a base capability in eastern China are looking more closely at setting up operations in the western part of the country. China’s Ninth Five-Year Plan aimed to address the widening disparities in wealth and income between the coast and the interior by concentrating investment, both domestic and foreign, in the interior provinces, and the Tenth Plan, which began in 2001, is continuing these efforts. Sustained high growth will require strong demand, yet the incomes of most rural residents (who account for 65% of the population) have been stagnant for the past four years. China will benefit from continued inflows of foreign investment and a increased exports as the global economy recovers. But given the country’s size, the economy still relies primarily on domestic engines of growth, which are sputtering. Migration to urbanization centers has increased over the past five years. This may help resolve the peasant problem, but has been the source of many intractable problems in other developing economies around the world and has been rather closely controlled in China. China is in the throes of a twofold industrial revolution. On the one hand, as with industrial revolutions in other countries, there is a movement of people from the countryside to the towns. On the other hand, to avoid the urban slums of other developing countries, an industrial revolution is also being encouraged in the countryside. While the majority of the labor force is still classified as rural (499m out of a labor force of 711.5m in 2000), as many as 150m, according to some estimates, have moved to cities in search of employment or higher wages. Millions more who live in the countryside are not employed on the land. An agricultural survey conducted in 1996 found that nearly one-quarter of the rural labor force had taken employment in rural industry or services. Including dependants, the true peasantry now numbers between 480m and 530m. The “non-agricultural village population” included in 1999 about 127m employed in township and village enterprises (TVEs). In the next section, we will look at the current state and expected development of the infrastructure in China and what it means to MNCs. China’s infrastructure is not yet as broadly implemented or as fully developed as in the highly industrialized nations. China’s unprecedented economic growth has strained its current logistics infrastructure to the limit. Challenges to the movement of goods abound: a limited and unreliable highway system, antiquated roads and ports, over-stressed civil aviation, a rapidly developing telecommunications network and limited warehousing capacity and quality. As a result, companies entering the Chinese market have had to develop new approaches to supply chain management. Currently, China’s most common transport method is road, followed by rail, air, and ocean or waterways. China’s road transport has a long way to go. The road infrastructure is seriously inadequate in many places. Although it covers 600,000 miles, it is mainly composed of two-lane roads with side paths for bicycles. At the end of 2000, China possessed around 16,000 kilometers of expressway nationwide, though this number is in question, and the World Bank’s analysis of road coverage relative to area and population places China far behind most other countries. A team of two drivers, working a 16-hour day, can cover some 310 miles — an average of less than 20 miles per hour. Acknowledging these problems, China is accelerating the construction of highways and roads. The principal mission is to connect China’s main economic zones with four leading state and trunk roads along the coast, the Yangtze River, and from Lanzhou to Lianyungang, and Beijng to Guangzhou. At the end of 2000, China had a road transportation network of 1.68 million kilometers, 804,000 kilometers longer than reported in the first national highway survey in 1979. At the end of 2001, the figure had climbed to some 1.7 million kilometers; the second largest road network in the world. In limited areas, highway construction has improved road conditions, and major projects are underway. Princeton-educated Hong Kong developer Gordon Wu built China’s first superhighway, a toll road reportedly modeled after the New Jersey Turnpike. It connects Hong Kong and Guangzhou, with planned further links to Zhuhai, adjacent to Macau. In addition, motorways have been opened between Shanghai and Nanjing and between Tianjin, Tangshan and Beijing. The road transport industry in China is extremely fragmented, with 5.4 million trucks registered to more than 2 million separate trucking providers (an average of 2.7 trucks per company). Among all providers, Sinotrans has the largest fleet (3000 trucks). Nevertheless, there is no true national trucking network: Regional, provincial and local fleets – managed by an eclectic mix of local entrepreneurs and local government-affiliated providers – dominate the market, primarily with inefficient, aging or inappropriate vehicles. The overloading, poor service, insufficient preventative maintenance, widespread inefficiencies, minimal quality control, excessive damage caused by bad road conditions and poor equipments are common in this industry. Empty miles average about 50 percent, with resulting annual losses of US$8 billion. 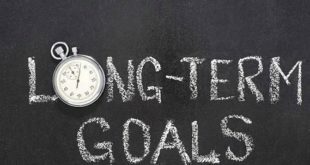 Comparatively little financing is available for upgrading equipment and investing in technology. Only 187,000 trucks are registered heavy – duty vehicles and a mere 20 percent of them are containerized. The containerized volume, 2.4 million TEUs in 1993, remains a small fraction of the total. The impact of the low containerization is that goods are frequently damaged in open-back vehicles. Foreign and domestic providers have begun to use container-capable line-haul trucks, which also facilitate inter-modal operations. Road bandits, unauthorized “tolls” and increasing traffic congestion have become pervasive. Some provinces levy extra tolls on out-of-province trucks. Local authorities have even been known to detain and fine out-of-town trucks. The power of local logistics authorities in China should not be underestimated. For example, many cities will not allow trucks to enter without licensing, which can take hours to obtain. Some provinces make it so onerous for outside trucking to secure licenses that shipments must be interlined to the next jurisdiction’s trucks. Other provinces regulate operating hours for visiting trucks. In some cases, trucks are restricted to one-way haulage, or are simply refused a license. Road tolls represent 15-20% of trucking cost, proportionately 9 times higher than in Europe. Because of these inefficiencies, electronics and food products cost 40-50% more to ship in China than in the US. Although costs are generally higher than rail and water, road transport is still the preferred option for moving packaged finished goods in China. The Ministry of Railways of China (MOR) is one of the world’s two largest railway passenger carriers (measured by passenger-kilometers) and is second only to the entire US railway system in freight traffic (measured by ton-kilometers). MOR’s labor force (3.3 million in total, about 1.5 million transport-related employees) is about twice that of India and is ten times larger than the US railroad workforce. In physical productivity terms, the density of traffic over the MOR network (measured in ton-km and passenger-km per km of line) is about twice as high as the next highest railway system (India) and is nearly three times the density in the US, while the annual output per locomotive, per freight wagon and per passenger coach are among the highest in the world. In comparison to its historical role as the backbone of the transport network, rail is still the predominant shipping mode for the strategic commodities as well as other bulk materials today, such as chemicals. However, transporting commercial freight by rail generally has been a low priority; there have always been severe capacity shortages and a poor service mentality. Some surveys indicate that between 25 percent and 30 percent of the country’s demand for cargo space on railroads cannot be met, and that approximately 2,000 towns are inaccessible by rail. It is also estimated that China is laying new double and electrified track faster than any other country in the world. As of by October 2000, China had 6,8000 km of railway tracks. The system is heavily used. Top priority is given to passengers and those commodities from agriculture and extraction industries controlled by state planning committees. Under the existing 14 administration units, China’s rail freight carriage is clearly threatened with fragmented service requiring many transactions. Chronic under-capacity means that bookings for less frequently used routes like Xinjiang generally need to be made as much as 30 to 40 days in advance. 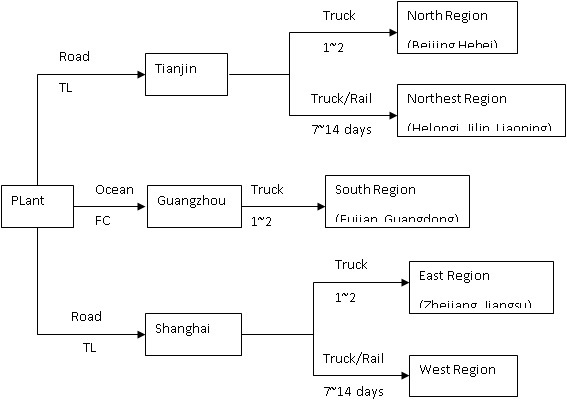 A survey by the China Communication and Transportation Association indicates that there is no notification of arrival at rail stations (the consignee or agent has to check frequently for arrival of goods), there is little integration of information technology between the provincial railways, and refrigeration is often lost during changeovers when reconfiguring the compartments. Moreover, to retain control over their key equipment, each of the Ministry of Railway’s 12 Regional Divisions prohibits its locomotives from crossing divisional boundaries. The resulting interlining between different provincial administrations increases costs and significantly degrades service quality. Trip times from Shanghai to a northeastern province average 15-45 days. (Delivery windows generally are measured in weeks rather days.) In addition cargo often ends up at the wrong destination or is simply lost in some rail yard. Some companies prefer to use trucks over rail because the railway containers are not compatible with maritime containers, or because there is no inter-modal link or convenient rail siding. In these cases, goods must be double handled, increasing the damage rates. (the damage rate for rail is estimated to be three times that of road transport). It is said that HAVI Food Service, which handles distribution for McDonald’s, uses truck rather than rail, simply because there is no reliable refrigerated service line at a competitive price in the market. In the next 5 years, an east-west high-speed railway artery will appear along the Yangtze River, linking Shanghai with major cities of Sichuan Province. The new railway is to run through seven cities and provinces: Shanghai, Jiangsu, Anhui, Jiangxi, Hubei, Chongqing and Sichuan, with a full length of 2024km. 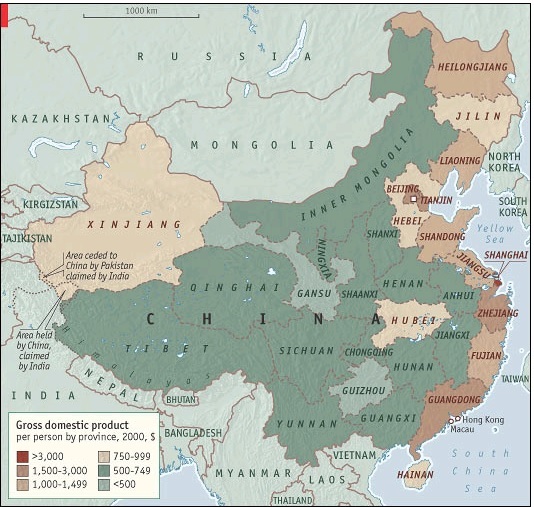 Both the GNP and grain production along the reaches of Yangtze River accounts for over one third of the national total and nearly forty percent of cities and population of China are located there. The new railway would help speed development of the regional economy by transporting natural resources from west to east and foreign capital and technologies from east to west. The major North-South railways:“JingJiu” and “JingHu”, which connect Beijing and Hong Kong, Beijing and Shanghai respectively, run through major industrial cities and agriculture bases in China. China’s Rail industry is controlled by the Ministry of Railways (MOR); in some sense a pricing cartel. Rumors suggest that the MOR will be eliminated and replaced by more efficient corporations with responsibility for freight, passenger and express services respectively. China has 5,800 rivers navigable for 110,200 km, 15 rivers over 1,000 km long and 12 lakes with an area greater than 1,000 km2. Nevertheless, the major IWW consist of only four rivers and one canal, which carry 80% of the total IWW traffic. The Yangtze River system is by far the country’s largest IWW. China has a long history of using this extensive waterway network of rivers, lakes and canals since the excavation of the Grand Canal, connecting river tributaries, was started in about 480 BC. However, the infrastructure and floating equipment have deteriorated badly. The size of the navigable network reduced from 172,000 km in 1960 to 148,400 km in 1970 and to 109,700 km in 1993. The Yangtze River’s 55,300 kilometers of waterway account for half of the country’s total river course. The total cargo volume is expected to be 300 million tons by 2010. Inland water transport for domestic distribution of goods is inexpensive, but it often is underutilized for a variety of reasons. For example, most ports lack the ability to process and manage cargo at international standards of efficiency. Shipping schedules are often inflexible. Delivery reliability is low and inter-modal operations often require multiple crane moves. Bureaucracy-related delays in customs processing occur routinely. Many ports cannot accommodate larger cargo vessels above 10,000 tonnages. Over the past 10 years the IWW transport sector operations have gradually shifted from fully state-controlled operations (planning, infrastructure, cargo allocation, fleet operations, port operations) to a mixture of state-controlled activities, incorporated state-owned but commercially and financially independent operations, and an increasing private sector involvement (fleet operators). IWW sector may negotiate the transport and port handling tariffs within a margin of +/-20% of standard tariffs set by the Provincial and/or Local Price Bureaus; a tariff variation of more than 20% requires approval of the Provincial and/or Local Governments. The shipping companies are financially and commercially independent, especially since the 1989 commercialization reform; they pay taxes to the provincial and central government; are entitled to plan their own investments within limits and fund their development from profits. Free competition between the shipping companies has already been instated, although the fleet composition and performance show that the state-owned companies carry comparatively more cargo over longer distances in larger barges. It is therefore good to know the ongoing gradual incorporation of the state-owned shipping companies. All shipping companies have free access to resources such as labor, fuel, equipment and materials. Tariffs are still set by the Provincial Price Bureau, although a variation of +/-20% is free to negotiate. 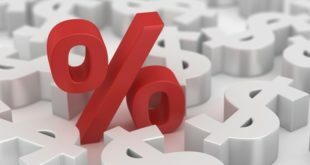 Credit lines are expected to open up to the private investor, creating potential for private ownership and further liberalizing the tariffs. In Hunan, Guangxi and Zhejiang, night navigation is practiced. Like most strategic components of China’s post-1949 economy, China’s ports were developed with the Cold War objective of achieving local self- sufficiency. This led to the evolution of many small ports, often little more than 100 miles apart. Today, these same ports compete fiercely with one another for hub status. To date, unfortunately, opportunities regional cooperation has been largely ignored and much money has been invested in white elephants. More than $8 billion has been spent since 1988 on new container-handling capacity, with another $6 billion committed through 2000 on ports and waterways from Qinhuangdao in the north to Yantian in the south. Additionally, foreign participation options are growing, ranging from port development to shipping. Both joint venture and wholly owned foreign enterprises have become involved in port and wharf construction and operation projects. A limited number of foreign transport operators have been authorized to deliver freight inland and offer door-to-door service, which can include use of the main river network. Shanghai, Ningbo and Guangzhou ports have the highest holding capacity in China. Qinhuangdao, Tianjin, Dalian and Qingdao follow. Tianjin Port, in north China, will invest Rmb1.5billion this year to increase its capacity. The money will be used to build and upgrade infrastructure, including the second-phase construction of a navigational channel for large vessels with a capacity of 100,000 tons. In 2001, the port handled 113.69 million tons of cargo, up 18.8percent year-on-year, to become the largest of its kind in north China. Qingdao Port handled 100.08 million tons of goods in the year 2001, with nearly 70 percent of the goods either imported products or Chinese products for export. The port, ranked third among the major ports in China, handles 2.6 million containers in 2001. Shanghai, China’s largest seaport, has ambitious development plans with significant inland implications. Work has begun on a 10-year, $900 million dredging project to deepen the mouth of the Yangtze River. When completed, this will enable ocean-going vessels of up to 1,000 TEUs to sail up the Yangtze as far as Wuhan (725 km), the major transportation hub of central China. Further, if the controversial Three Gorges dam project is completed, similar vessels could navigate the length of the Yangtze up to Chongqing (2,400 km). In anticipation of these developments, surrounding river ports are enhancing their facilities to take advantage of the new traffic. Shanghai was the world’s third largest port and fifth largest container port in 2001. Shanghai handled a record 8 million containers during 2002, ranking fourth in the world. Other major port developments in the south have transformed the Pearl River delta into a major gateway with potential to become a long-term competitor to Hong Kong. Shenzhen Port in south China’s Guangdong Province handled 5.08 million TEUs of containers in 2001, taking the 8th place in the world. The Yantian port near the Shenzhen border with Hong Kong has emerged as a deep-water alternative to Hong Kong. Three berths opened at Yantian in 1995, and at least 10 more are scheduled for construction. Meanwhile, the Shekou port is evolving into a major container-handling facility for the Shenzhen Special Economic Zone. Shenzhen’s growth has been astounding. It ranked only No.21 in 1997 among the world’s container ports. Despite these developments, Hong Kong’s Kwai Chung port, the world’s busiest, continues its expansion with Terminal 9 due to open this year. China’s domestic waterways—encompassing more than 38,000 navigable miles—carry nearly 1 billion tons of cargo, though containerized traffic remains a tiny fraction (less than 3 percent) of the total. Development priorities are aimed at increasing domestic containerization and improving access to the Yangtze River. The responsibility for inland waterway port operations has been transferred to the Provincial Communication Departments. In some cases specific port companies or corporations have been established to assume responsibility for the operation and further development of certain port facilities. Ocean Shipping has been among the most open and advanced sectors in China logistics. With accession to WTO, China’s exports are expected to increase with cargo destined for international markets expected to rise to 650-700 million tones by 2005, from only 400 million tones in 1999. Container ports like Shanghai and ShenZhen are predicted to join the ranks of the top 5 biggest container ports of the world in terms of throughput. Container volumes are predicted to rise above 40 million TEUs by 2005. China recently invested US$1.7 billion in inland water transportation, with the goal of developing an international standard container network with inter-modal capabilities. The largest three Chinese carriers – COSCO, China Shipping Group and Sinotrans – will benefit from WTO entry. Some of them are already ranked among the top carriers in the world. In general, ocean and inland water transport is not suitable for moving high-value finished goods and time-sensitive freight.. Because of its low cost and low pilferage and damage rates, shipping and inland barges can be a good solution for bulk commodities transportation. However, this mode is severely underutilized for lack of required infrastructure. Airfreight in China is predicted to grow considerably over the long term, but current air cargo activities are fraught with problems. Alternatives are limited: domestic air routes are circuitous and flights to some areas infrequent; prices are high; routes are fragmented; information exchange between airlines and forwarders is limited. As most major Chinese airlines focus on building their passenger business, cargo capacity is often inadequate. Moreover, domestic freight forwarders rarely provide the kind of basic, value-added services that are the norm in the United States and Europe. Some do not even provide support services, such as local pickup and delivery. Despite these limitations, foreign service-providers have been restricted from expanding. With China’s entry to WTO, the picture of freight forwarding industry will change dramatically. International freight forwarders will join the competition and raise the service standards. 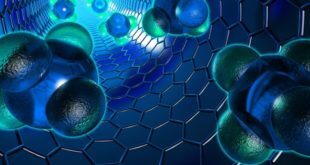 After two years’ operation in joint ventures, they will be permitted to expand and after four years to operate wholly owned subsidiaries in China. Furthermore, China’s Civil Air industry is undergoing a reform, merging into three big air transportation corporations, which will strengthen their competency and help regulate the industry. Policy Restrictions are the main challenge for foreign companies providing logistics services in China. The Chinese term for logistics is wu liu -“flow of goods,” is new and unfamiliar to many government officials, etc. In many ways, wu liu is still being defined in China. Naturally, it is difficult to issue a license for a service that is not well defined. The logistics industry in China is regulated by many government ministries and departments including: China Customs, Ministry of Foreign Trade and Economic Cooperation (MOFTEC), Ministry of Communications, Ministry of Railways, Civil Aviation Administration of China (CAAC) and Ministry of Internal Trade. Figure 1 shows the structure of these government organizations. In addition, local authorities promulgate regulations controlling the flow of goods within their jurisdictions. Figure 2 shows the organization of provincial government departments regulating the logistics sector. The diverse and several governmental bodies regulating the industry lead to complex regulations that vary widely across jurisdictions. 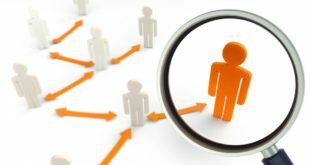 Consequently, government officials regulating in logistics sector can appear arbitrary and guanxi or social connections involving business associates, families, and acquaintances in complex networks of social support and sentiment can be invaluable. For example, a truck licensed in Beijing must obtain a license from the local Shanghai Traffic Bureau to make deliveries in that city. Often local government officials are motivated to protect local companies transforming a small nuisance into a major barrier. There are several related industrial associations in China, including the China Transport and Communications Association, China Storage Association and China Logistics and Purchasing Association. The influence of these organizations is less immediate and direct. forwarding must be approved by MOFTEC in accordance with the prescribed procedure. Licenses are only valid for three years, and applications for renewal must be submitted 30 days before the expiry date. Moreover, licensees must submit annual reports to the Commission of Foreign Trade and Economic Cooperation. Currently, logistics providers must form joint ventures (JV) with Chinese companies to obtain a license. After finding a suitable JV partner, the application procedure involves approvals by several government authorities and can be rather long and drawn out. 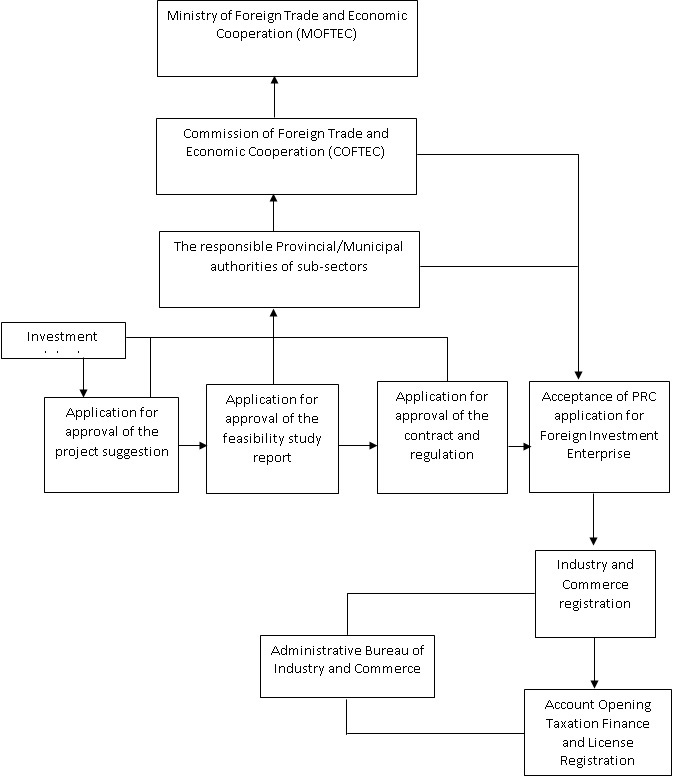 Figure 3.4 outlines the approval process for freight forwarding joint ventures. Customs clearance can be a painful experience for logistics managers. Customs agents can be un-cooperative and are sometimes corrupt. Foreign importers and exporters complain of long clearance times and inconsistent practices at customs. Current Chinese Customs Law subject all import and export goods to customs examination. During the examination, the consignee in the case of imported goods or the consignor in the case of goods for export must be present and is responsible for moving opening and re-packaging the goods. Customs officers are entitled to examine or re-examine goods or take samples as they see fit. Although it is a federal bureau, China Customs is separately administered in each province. Customs officials are given wide powers to enforce administrative law and implement anti-smuggling policy and some provinces have complicated the customs clearance process. In fact, cargo must pass through customs even in crossing from one province to another. In the past guanxi and out right corruption played a too important role in Chinese customs. The Chinese government has taken action to fight corruption. In July 2000, a new chapter under the title of “Law Enforcement Supervision” was added to the Customs Law. Under the amended legislation, discipline inspectors and supervisors oversee all customs offices. Moreover, China’s customs authority is making substantial reforms to cope with the increased trade flow accompanied by WTO membership. A unified electronic customs clearance system is being built in Shanghai, Beijing, Tianjin and Guangzhou on a trial basis. In September 2002, 500 firms began trials of the new system in Shanghai (China Daily 2002). No quotas or licenses for import and export are required in the FTZ. The warehousing enterprises in the FTZ can store goods demanded in the domestic and international markets, with the exception of those prohibited by law. There is no time limit for the storage of goods for transit, and the transit goods may undergo processing, grading, and repackaging in the FTZ. The Zhuhai FTZ (2001) claims to connect in-zone enterprises and the customs office by a computer system that supports Electronic Data Interchange. In December 2000, MOFTEC issued a notice canceling the examination and approval regulations for the establishment of branches by international freight forwarding enterprises in areas for which business operations have already been approved. The notice introduced a registration system to replace the examination and approval system. In January 2001, MOFTEC issued a notice opening up China’s railway freight market to foreign investors. Foreign companies are allowed to establish joint-venture railway freight service companies with Chinese partners. The foreign investors must be financially strong, have no less than 10 years of operational experience in the railway freight service industry, and have a good performance record. Moreover, the Chinese partner must hold greater than 50 percent of the shares in the joint venture, and the joint venture must have over US$25 million in registered capital. In June 2002, The MOFTEC has issued a circular allowing the establishment of foreign invested logistics enterprise in eight certain pilot locations. These pilot locations include Juangsu, Zhejiang, Guangdong, Beijing, Tianjin, Shanghai, Shenzhen and Chongqing. The allowable business scope of the logistics companies includes international logistics business and third-party logistics business. The companies may be formed as joint ventures with foreign investors’ shares not exceeding 50%. International logistics business includes: Import/export (‘I/E’) and relevant services, including I/E on its own account or I/E agency services, export agency services for export processing enterprises, international transportation agency services for I/E of commodity by sea, air and land. Third-party logistics business includes: general land commodity transportation, warehousing, loading and unloading, processing, packaging, distribution and relevant information processing as well as consulting; domestic freight forwarding. Freight forwarding services Foreign companies operating in China should have at least three consecutive years of experience. Majority ownership in freight-forwarding joint ventures will be allowed one year after The minimum registered capital of a joint venture must be at least $1 million and the length of operation must not exceed 20 years. After one year of operation in China, a joint venture may set up a branch if it adds $120,000 to the original registered capital for each branch established. Wholly owned subsidiaries can be set up four years after accession. All restrictions will be eliminated within four years. Distribution of products In the first year after China’s entry, foreign-invested companies may distribute products made in China and imported products. Majority ownership in Wholesaling and Retailing joint ventures are allowed two years after accession. Foreign investment wholesaling and retailing companies are allowed to provide services and set their own distribution channels free of land restriction within three year of accession. Freight transportation Currently, international maritime carriers are not allowed to offer inland distribution services. Under the new WTO regime, within a year of accession, foreign shipping companies can establish joint ventures with domestic companies to offer inland transport for international containers and establish domestic distribution networks. All restrictions to establishment will be phased out within four years. Majority ownership in Road Transportation joint ventures will be allowed one year after accession. Wholly owned subsidiaries can be set up three years after accession. Majority ownership in Rail Transportation joint ventures will be allowed three years after accession. Wholly owned subsidiaries can be set up six years after accession. Courier services The commitments cover land-based international courier services and all services related to international shipments handled by an express carrier. Foreign companies will be able to establish joint ventures upon accession, hold majority equity shares within one year, and be free of restrictions within four years. International Freight Forwarders are mainly responsible for the international aspects of freight management. Domestic freight forwarders, usually sub-contracted by international freight forwarders, currently handle inland transportation within China. This picture will change in the future when foreign-invested freight forwarders are allowed to conduct domestic business. There is little integration in the provision of freight forwarding logistics service in China. Most companies participate in only a few of the sub-sectors, rather than providing a total service for the entire market. Foreign involvement in China’s freight forwarding market is already substantial even though most foreign companies are only authorized to engage in international freight forwarding. International forwarders may also appoint a Chinese forwarder and set up a local representative office. An important reason for foreign Freight Forwarding companies’ entry into the China market is to serve their international customers – multinational manufacturers who have established production plants in China. However, as the economy has developed, domestic firms have created a demand for freight forwarding services all their own. After accession to WTO, demand for both international and domestic freight forwarding services is projected to grow. Exports are expected to rise by an additional 2.4% per year over the first five years of accession, while the effect on imports could be higher. On the domestic front, restrictions on distribution of most products will be phased out over the next few years. Foreign firms will be able to distribute imported products as well as those made in China. Most multinational forwarding companies have already established a presence in China in anticipation of the growing demand. 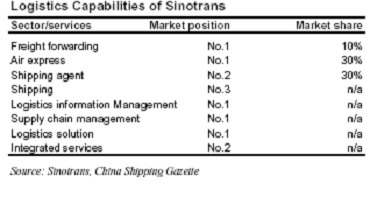 Sinotrans is a leader among domestic players in terms of IT adoption. The company offers EDI, worldwide online cargo tracing, booking and information retrieval. Its road vehicles are equipped with GPS and OmniTrac. Its warehouses are equipped with MK Logistics warehouse management system. Sinotrans has both Chinese and multinational clients in telecommunications, consumer electronics and food & beverage. For example, Sinotrans offers e-commerce distribution for Stone (a Chinese domestic .com IT company), and distribution for Price-Smart (a US based Grocery Chain Store). For Motorola, Sinotrans even has a team stationed in its Tianjin manufacturing factory as part of the client’s supply chain. Sinotrans is the earliest partner In China of global express giants DHL, UPS, TNT and OCS. The company participates in joint ventures with Danzas and Exel in China. For example, early in 1984, Maersk Sealand established a representative office in Guangzhou. As the first foreign carrier in China, Maersk Sealand received shipping license No. 001 from the Chinese Government. 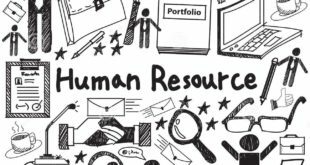 Since then, the company has invested heavily in building a wide network of offices with dedicated staff at key locations. In 1994, it established a wholly owned agent for Maersk Sealand in China, Maersk (China) Shipping Co., Ltd. Today, Maersk Sealand is the largest foreign carrier in China with direct services to Yantian, Ningbo, Xiamen and Shanghai and with dedicated feeder services covering other key ports. The Maersk Group is actively involved in the development of container terminals in Dalian and Yantian. In addition, through its subsidiary, Maersk Logistics (China) Co. Ltd, the company provides services such as supply chain management, warehousing and distribution, air- and sea- freight forwarding, customs brokerage and other value added services. Through the joint venture Shanghai Tie Yang Multi Modal Transportation Co. Ltd. (TMT) between the Ministry of Railways and the A.P. Moller-Maersk Group, the company provides containerized railways transportation services from a large number of cities in China’s interior provinces9. Cosco, founded in 1961, is China’s largest ocean carrier with Rmb500 billion in assets and 600 ships of 17 million tons capacity. It is one of world’s top 10 ocean carriers. As a state-owned enterprise, Cosco long enjoyed its monopoly position at both the national and provincial level and substantial support from the Chinese government. The company’s services have expanded to include: freight forwarding, ocean shipping, ship agency, air agency, multi-model transportation, ship maintenance and repair, real estate as well as storage and warehousing. Cosco is ranked the 7th largest ocean container line operating over 118 container ships with a total capacity of nearly 195,000 TEUs. Figure 4.2 describes the company’s shipping capacity11. It has initiated restructuring plans to provide specialized integrated logistics service through the establishment of Cosco Logistics Co. Ltd. To strengthen the ability of inland transport, Cosco Logistics has launched a new containerized railways liner delivery service through collaboration with china railways. The “Big three”: Air China, China Eastern Airline and China Southern Airline are the dominant air carriers in China. Air China, based in Beijing, for many years a classic monopoly international operator and the only national flag carrier, is the country’s largest air Carrier with Rmb35.9 billion in assets. China Eastern Airline is based primarily in Shanghai, while China Southern Airline is headquartered in Guangzhou. The “Big three” primarily operate as passenger carriers, with about 80% of revenue coming from this segment. The government of China encourages merger and consolidation among the domestic carriers to help create a domestic industry capable of meeting the international competition after WTO. In March 2002, the Civil Aviation Administration of China (CAAC) announced more definite plans to consolidate the industry, following the first across-the-board annual financial loss for 20 years. This may reduce the existing 30 or so airlines to less than 10 major entities. Externally, the forces of industry concentration are almost as strong. Each of the major global airline alliances is courting the ‘big three’ carriers. To date, they have entered various bilateral code share and other marketing relationships. China Southern Airline (CSA) flies to 65 domestic cities and Hong Kong, as well as 23 international destinations. Its expansion plan in 2002 is to double its freighter operations as it takes delivery of its own freighter aircraft12. CSA is also marketing higher-value added services as it expands into branded express products beyond airport-to-airport heavy airfreight and mail. CSA is also planning to expand its own cargo handling terminals at its primary cargo hub in Shenzhen and at the new Guangzhou airport. Haier Group was incorporated in 1984. Over the past 17 years, Haier has witnessed an annual sales increase of 78% and made significant achievements with a wide range of household electrical appliances made in 86 categories and 13,000 specifications. Haier generated total sales revenue of USD7.28 billion in 2001 with an export value of USD420 million to the US and 160 other countries. Haier has 1600 container trucks, 42 distribution centers, 3 million square meter warehouses, and all the facilities are linked with SAP LES logistics execution system to achieve 24-hour delivery in regional cities. Haier intends to expand its logistics business to offer third party logistics services leveraging its current advantage of huge goods flow and powerful infrastructure. The company transformed its in-house distribution unit into an independent logistics services company. The new alliance with China Post will give Haier access to that organization’s network and transportation assets. Haier’s long term strategy calls for continued growth internationally and in its logistics services. China Merchants Logistics Group Co., Ltd. Founded in 1872, China Merchants was the first truly commercial Chinese company. It became the first wholly PRC invested company to be based in Hong Kong in 1950, and the first to be listed on the Hong Kong Stock Exchange in 1979. Also in 1979, China Merchants established China’s first Industrial Free Zone, which greatly contributed to the opening up and reforms of China. Today China Merchants diversifies itself in industrial zone development, logistics, infrastructure and finance with total assets of US$6 billion. As a leading player in logistics in China, China Merchants Logistics (CML) has emerged through an amalgamation of the Company’s transport, shipping, warehousing and forwarding businesses. Additionally it established 3PL joint ventures (JVs) with Singapore (Sembcorp and PSA) and UK (Tibbett and Britten) in the mid-90’s. Shenzhen Anda Cargo Transportation Co., Ltd.
Shenzhen Anda Container Transportation Co., Ltd.
Shenzhen Anda Passenger Transportation Co., Ltd.
China Merchants Kin Swiss Transportation Co., Ltd.
China Merchants Shipping & Enterprises Co., Ltd.
China Merchants Petrochemical Co., Ltd.
Shenzhen Xunlong Shipping Co., Ltd.
China Merchants Marin & Trans (Shekou) Co., Ltd.
Shenzhen St-Anda Logistics Co., Ltd.
Shenzhen Tibbett & Britten-Anda Logistics Co., Ltd.
China Merchants-PSA Logistics Network Co., Ltd.
Qingdao Beer Merchants Logistics Co., Ltd.
Liaoning Chenda Merchants Logistics Co., Ltd.
CML provides domestic distribution, coastal shipping, port operation, dangerous goods delivery, logistics software, freight forwarding, etc. These services are currently provides by independent subsidiaries, but CML intends to consolidate common operations like IT, transportation, customer brokerage and warehouse management as it moves toward fully integrated supply chain management capabilities. One distinguished service of CML is dangerous goods distribution such as LPG, diesel and gasoline. Operating through 11 major hubs, CML’s distribution network covers procurement, warehousing, distribution and sales of petrochemicals in south, middle and eastern China. 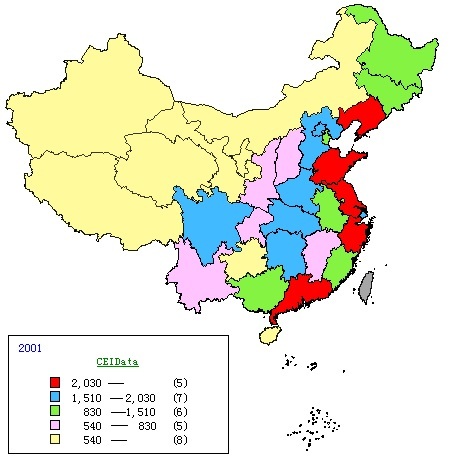 CML focuses on three regions: The Pearl River Delta, the Yangtse River region and the Bohai Basin. ST-Anda is a joint venture formed in December 1995 between Sembcorp Logistics (SCL) of Singapore and China-Merchants Logistics Co., Ltd. SCL holds 51% stake in the JV – a unique position for a foreign logistics company in China that was approved by the Ministry of Communication, Guangdong Provincial Government and Shenzhen Municipal Government. As an early entrant in China, ST-Anda has a nation-wide license to provide third party logistics services consisting of warehousing, general haulage, distribution of goods, and information technology services. ST-Anda is a non-asset third party logistics player that operates a national transportation network including 20 distribution centers and 9 forward DCs with a combined warehousing space of 145,000 square meters serving more than 600 cities in China. It claims to be able to deliver goods to 50% of these cities within 48 hours. ST-Anda’s core services include warehouse management, transportation management, inventory management, fulfillment, inbound logistics, retail supply chain management, cross-dock management and customs brokering. The company’s value-added services include kitting, assembly and cable cutting and drumming. It is in the process of developing a credit and collections business and is enhancing its capabilities in reverse logistics operations. 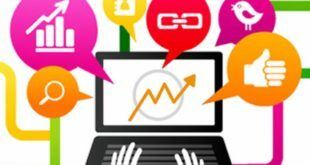 The company operates a Call Center to offer pipeline inventory tracking information and resolve service problem. In June 2002, ST-Anda became ISO9001 certified. ST-Anda’s main customer segment is fast-moving commodity producers such as Colgate Palmolive, Johnson & Johnson, Pepsi, Kraft Foods, L’Oreal, and CPC Best Food. Another segment is pharmaceutical enterprises like Xi’an Janssen. The company also provides distribution services for chemical producers like Exxon and GE Plastics. APLL is licensed for logistics activities in almost all major key markets in China. In 1990 APLL established strategic alliance with United Development Company who is engaged in construction, property management, import and export, domestic retailing and wholesale, bonded warehousing and investment consultation in Shanghai Waigaoqiao Free Trade Zone. In 2001 APL Logistics signed working agreements with two of China’s leading road and rail companies — the Eastern China Railway Express (ECRE) and the Shenyang Transportation Group (STG). In June 2002 APLL Logistics set up a joint venture with Legend Group Holdings to provide supply chain services for China’s IT businesses including Import/Export, Customs Clearance, International and Domestic Air/Ocean Forwarding, Domestic transportation and door-to-door delivery. One month later APL Logistics and three other parties formed a JV named CMWAL Co., Ltd. who focuses on inbound and outbound logistics services for automakers in Chongquing, southwest of China including Ford and Suzuki. APLL mainly focuses on the retail, auto, chemical and IT industries. Tibbett & Britten Group (TB) of the UK is one of the world’s largest third party logistics companies, operating retail logistics service in 33 countries. In the mid 90’s, TB formed Tibbett & Britten Anda Logistics in Shenzhen with China-Merchants Logistics. TB established Hutchison Tibbett & Britten Logistics (HTBL) with Hutchison Whampoa, a Hong Kong company focused on property, retail and wholesale, hotels, communications and port management. HTBL is a logistics service provider for the retail industry. HTBL customers in China include: P&G, Warner Lambert, Jian Hypermarket, Wu Mart, Park’n Shop, etc. Policy has always played an important role in the development of logistics. Before 2001 foreign investment was highly regulated in the field of transportation, DC setup, brokerage, courier delivery, etc. China’s accession to the WTO will also bring a decisive change to the regulatory regime on foreign investment in this sector. In freight forwarding, majority ownership in joint ventures will be allowed one year after accession, while wholly foreign-owned subsidiaries will be allowed within four years of accession. Foreign companies will no longer be restricted to international freight forwarding activities. In most logistics sub-sectors, including storage and warehousing, express delivery and ground transportation, majority-owned joint ventures will be allowed one to two years after accession, while wholly-owned enterprises will be allowed in three to six years. Railways will be gradually deregulated in the next six years. Retail and chain stores constitute an important segment in the opening of the distribution sector. In China foreign companies will gradually be allowed to hold a controlling share in Sino-foreign joint-venture retail enterprises. China will open all provincial capitals to foreign investment, and remove geographical, quantitative, equity and incorporation restrictions. By the year 2005, the only foreign majority ownership restrictions will affect department stores with a floor area of over 20,000 sqm and chain stores with more than 30 outlets. Based on these commitments, foreign chain-store operators will be able to develop on a larger scale. In fact Wal-Mart opened its Beijing Mart immediately following China’s entry into WTO and intends to open 10 additional markets the next two years. On June 20, 2002 the Ministry of Foreign Trade and Economic Cooperation (MOFTEC) announced “Notification of Setup of Foreign Investment Logistics Enterprises (FILEs)”, identifying eight regions selected to enjoy more favorable and flexible logistics policy for MNCs. 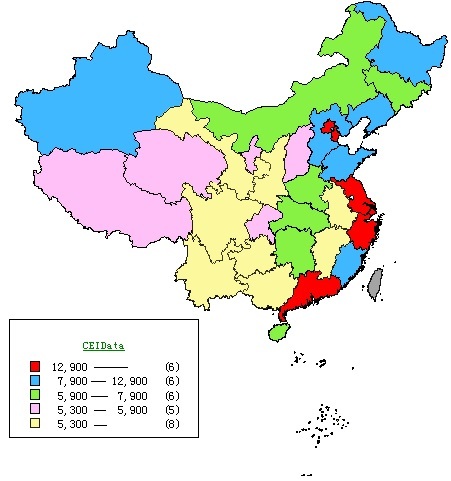 The eight regions are Juangsu, Zhejiang, Guangdong, Beijing, Tianjin, Shanghai and Shenzhen. The new FILEs must have a registered capital no less than 5 million US dollars and less than 50% foreign ownership. FILEs are allowed to engage in an integrated logistics services combining transportation, warehousing, valued-added processes, import & and export, etc. The permitted activity includes international logistics and third party logistics. In the west of China, drivers must be cautious to navigate the steep-slopes around the mountains. The terrain restricts vehicles to speeds of 10 miles/hour for long periods. Only very skilled drivers can ship bulky products in this way. In fact, drivers from the east often employ local drivers to help them over the mountain roads. In the north, the main challenge is the very cold winter. Currently there are two routes to this region: one is by land from Beijing by truck or — a distance of more than 1000 kilometers; the other is by ferry from the Bohai Gulf overnight from Yantai on the Shandong Peninsula to Dalin and then by truck. For many commodities, the hot sales season is just before the Spring Festival. During this period, both routes operate at capacity and producers are hard pressed to deliver products to the region at this peak period. Rail delivery usually takes one or two weeks to this region because of frequent interlining, and the thick-snow and ice in road slows truck travel to tortoise pace. Ferry delivery, storm is subject to the volatile winter weather around the gulf and ferry capacity is limited. A famous beer manufacturer in China typically relies on rail, getting its products to the northeast region in 5 or 6 train components of 300 tons per shipment. During the peak Spring Festival, all products are immediately shipped out once they reach the end of production line. Sometimes the manufacturer resorts to ferry and truck delivery. The development of road infrastructure had promoted the development of private fleets. Even state-owned transportation corporations have sold vehicles to individuals in response to market pressures. As a consequence, transportation brokerage has evolved. The intermediaries play an important role in the domestic transportation market. They are in charge of market development, shipping schedules, shipment consolidation, just like freight forwarding companies, but generally on a very small scale. The drivers find backhauls on their own because most brokerages are local and do not have access to loads at the destination unless they have partners there. To make a living, drivers accept loads far in excess of the truck’s capacity. The annual fees local transportation bureau levy for a truck are based on the registered capacity of the engine, not the weight of the loads it hauls. Similarly, local tolls, which can account for 15%~25% or even 30% of total transportation cost are based on rated engine capacity. It is common for 20 ton trucks to haul more than 30 or even 40 tons. Over-loading the vehicle can reduce these charges, but sometimes leads to penalties or fines. This makes rating a challenging business. Over the road the Ministry of Communication administers transportation, while the Ministry of Railway administers the railroads. This sometimes leads to a painful absence of coordination and integration. For example, the dimensions of road containers are not compatible with those for railways. Consequently container-on-flatcar intermodal operations are not available in China. Road containers are compatible with ocean containers. Unlike the US, a tractor and its trailer are licensed as a unit in China and so cannot be operated independently. The MOC is currently exploring the situation. The transportation and logistics sector has historically been under the control of state monopolies and its liberalization will be a complex process as it involves the coordination of inter-modal transport both at the provincial and national level. The fact that various logistics sub-sectors are under the control of many different government bodies does not facilitate the transition. At present, there is little integration in the provision of logistics services in China. Most companies participate in one or a few of the sub-sectors, rather than provide truly integrated services. The Chinese government encourages and supports logistics services and commodity distribution in order to speed the reform and modernization of the logistics industry. The policy for opening the distribution sector to the outside world encourages and even requires foreign investors to invest in logistics and distribution facilities. Some corporations have already established their own distribution centers that offer value-added services. For example, Japan’s Mitsubishi has built an integrated distribution center in Guangdong. Situated close to Hong Kong and well-served by the Beijing-Guangzhou and Beijing-Kowloon railways as well as a number of newly-built superhighways, this center is ideally located to support inter-regional distribution. Some foreign corporations have also built their own fleets of trucks. Perhaps the best example is McDonald’s. The company delivers buns, meat and other foodstuffs to warehouses throughout China everyday and has established its own transportation company to ensure timely deliveries. Congestion in urban streets cannot be overlooked. Although urban transportation infrastructure has developed rapidly, neither urban road construction nor traffic control are able to keep pace with the growth in traffic volume. Today, traffic congestion is a major bottleneck for urban delivery in big cities like Beijing, Shanghai, Guangzhou and Shenyang. To overcome this problem, some foreign corporations use bicycles to deliver goods. For example, Coca-Cola employs hundreds of “neighborhood committee” members to make deliveries on pushcarts and bicycles to areas not easily accessible by motor vehicles due to traffic congestion. These flexible distribution methods have proved to be immensely successful. Currently 80% of 3PLs in China are losing money due to price competition. Based on ST-Anda Logistics estimates of logistics cost (transportation & warehouse excluding inventory carrying cost) as a percent of total revenues in various industries are illustrated in Table 5.1. Established by a well-known overseas Chinese merchant with a long history in the business years, China Spirits is one of the first industrialized wineries in China and one of Asia’s largest winemaking enterprises. In 1997, China Spirits arouse out of the merger of several subsidiaries and was listed on the Shenzhen Stock Exchange. The company mainly produces brandy, wine, champagne and health wines. There are few barriers to entry in the wine industry and so with time competition has intensified. By 2000, China Spirits recognized that although its revenues continued to rise, it was losing market share. In response, top management encouraged the sales department to improve sales in the low season. This coincided with the next around of transportation bidding, and the logistics manager Peter invited a 3PL to participate. The 3PL’s investigation of China Spirits’ operations and distribution system revealed that different Vice Presidents managed different departments with little coordination. Peter, for example, was especially sensitive to the fact that sales often accepted small orders under unfavorable delivery terms. China Spirits sells more than 40,000 tons per year and the annual total transportation costs are around 30 million RMB. Top management has asked Peter to reduce total transportation costs by 10% next year. The evaluation of the bidding is solely based on the transportation rate charged by the fleet, which is fixed for the entire year and does not depend order size. Winners are allocated different regions. Once a contract is signed, the winner should submit its guarantee capital, which will not be refunded if it breaks the contract. He received a call from Guangzhou Port who urged him to collect the containers that have been sitting at the port for six days. Usually Containers are allowed to remain three days free of charge. Sales in Guangzhou was reluctant to collect them. To remain within the allowed inventory limits, sales in each region tend to place small frequent orders and frequently complain that the orders do not arrive on time. 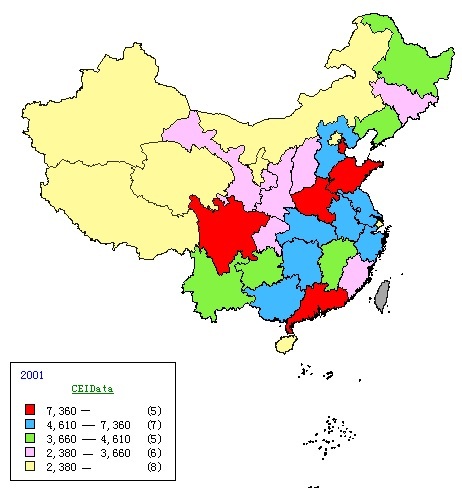 Regions in the south, east and north of China are allocated to different fleets. The different order sizes and frequencies in those regions incur different transportation costs. After one year’s operation, some fleets declined to participate in the bidding because they were hard pressed to make any money. Peter will have dinner with a local ocean carrier to help ensure that products shipped out on schedule for the important Mid-Autumn Festival and National Day seasons. Poor forecasts and the prohibition against selling across regions mean that some products sit in storage in market regions for more than one year. This further complicates sales challenge of keeping stocked with fast moving items while respecting the inventory limits. If Peter strictly enforces the bidding contract, no fleet will be refunded its guarantee capital at the end of the year. But then, who will ship goods for the company next year? As illustrated in Figure B1, the three distribution centers recommended are: Tianjin, Shanghai and Guangzhou to serve regions in the North, East and South respectively. The 3PL sets a very high service level of 2 days delivery in these regions considering the associated high contribution to the annual revenue. Because regions in the west and northeast can only generate 4% and 6% of revenue respectively, the 3PL does not set a high service level in terms of transportation mode and delivery time. Inventory level is determined under ABC principle. Generally speaking, Dry Red Wine is in A class, Health Wine, Brandy and Common Red Wine in B class, and Champagne in C class. In terms of possible sales changing in the near future, a dynamic review of inventory level is necessary. For example, sales of Health Wine, a new fashion in China, are booming in the south and east, and so may quickly move to A class. Tianjian and Shanghai are replenished daily in the peak season and week delivery in the low season. Once replenished, products are sorted and distributed simultaneously, and therefore a high service level is ensured without high inventory costs. The mixed-order of replenishment initiated from each DC is determined by the associated inventory level and capacity of TL shipment. Total inventory costs can be reduced by at least 30% without reducing service levels. Eliminate the prohibition against sales across regions and promote inventory pooling. Transportation costs are already very low. Under the new system, distribution costs in the second stage from DC to retail outlets will increase more than expected as the orders become smaller and delivery distances shorter. The target 10% reduction in annual transportation cost neither be justified nor achieved. On the Edge: The Changing Face of Supply Chain Management in China By Robert J. Easton, Accenture Viewpoint issue 3, 2001, Supply Chain Management. Tags 3PLs APL Logistics China China Logistics China Logistics Chanllenges China Merchants Logistics Group Co China Spirits Bidding Year case study China Spirits Logistics Challenges China's Infrastructure China's Logistics policy China's Political Division Freight Forwarding Companies in China GDP Per Capita in China Hutchison Tibbett & Britten Logistics List of Free Trade Zones in China Logistics Companies in China Logistics Players in China Logistics Policy of China Ocean and Air Carrier Companies in China Shenzhen ST-Anda Logistics Co.